Accommodating two kids in one room can be a design challenge not only space-wise but also style-wise. This is especially tricky with kids of different age, not to mention a girl and boy shared bedroom where along with the layout you have to coordinate colours and storage needs. If your kids are old enough a bedroom set with a bunk bed is a great space saving solution. 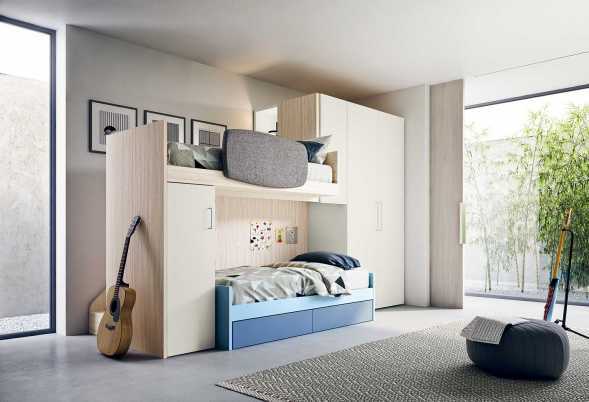 Contemporary bunk beds make the most of every vertical inch available allowing for storage and playing, while keeping the floor space decluttered. Modular bedroom furniture also offers the advantage of infinite combinations: corner bunk bed and wardrobe, bunk bed and desk, bunk bed with low trundle bed or built in storage underneath. L-shaped layouts are perfect for small rooms where you need to create a compact bedroom set without taking up too much footage. These models use two walls and give kids plenty of storage and workspace to study and do their homework. The high sleeper can be accessed via a ladder or staircase: the first option is best for tiny rooms, the second is great for larger rooms, for children who wake up during the night and for the adults to tidy up and make the bed for their younger ones. Plus: if you need extra space the steps can incorporate storage. Last but not least, you can configure the bunk bed for two, three or four kids. In fact, the low sleeper is a freestanding piece you can choose among many models, also with double and triple trundle. 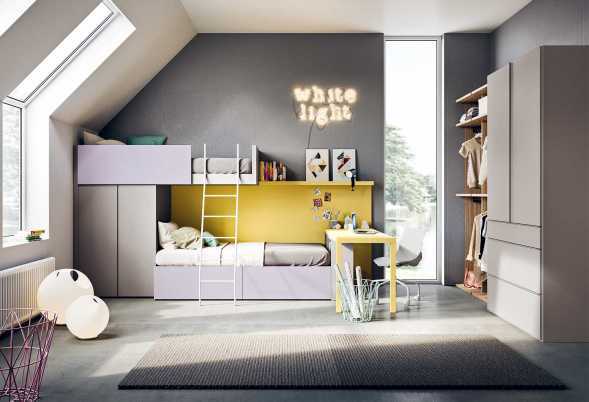 Along with bunk beds loft beds are a great option for kids and they sure get the teenage stamp of approval thanks to the possibility of creating a cool lounge area underneath. In planning a child's or teen's bedroom remember that their agenda gets busier and busier, which means lots of friends coming and going, birthday parties and sleepovers. Together with a sleeping area and storage furniture, try and plan a nice relax area where they can play, study or simply chat with their besties. A lofted bed is just the perfect solution to free up floor space making for a great nook that teenagers will love to furnish with some beanbags or a couch, a desk or coffee table for tv or computer. For younger children you can set up a nice and cozy playroom with a rug and soft furniture. Don't stop at pictures: each bedroom set features modular customizable furniture. 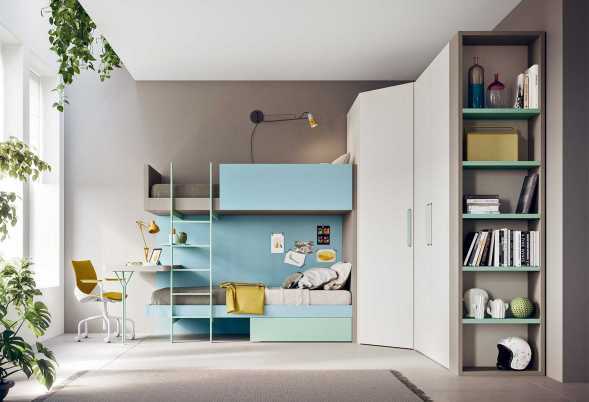 Browse through product pages to find ideas and suggestions, then contact us to find out everything you need to know about our Italian teens and kids bedrooms, prices and configurations. 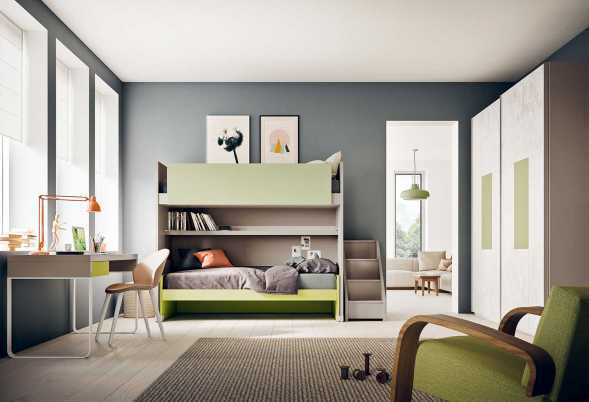 Children's bedroom set with bunk bed Start S28 is an innovative space saving solution for siblings shared bedrooms. A large two sliding door wardrobe provides plenty of storage space for both kids. 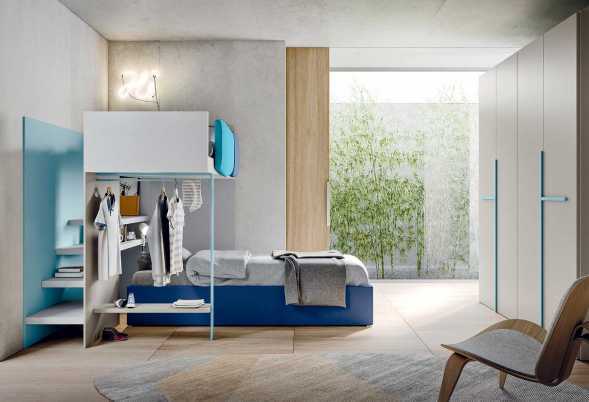 Start S29 is a smart space saving bedroom furniture set with a one-wall layout. It features a loft bed, a cabin bed with drawers and a large 105 cm deep two-door wardrobe. Maximizing the corner space in children's bedrooms is a must do. Start S30 kids bedroom with L-shaped bunk bed makes the most of every inch of space thanks to murphy-bunk bed combo and bridging wardrobe. 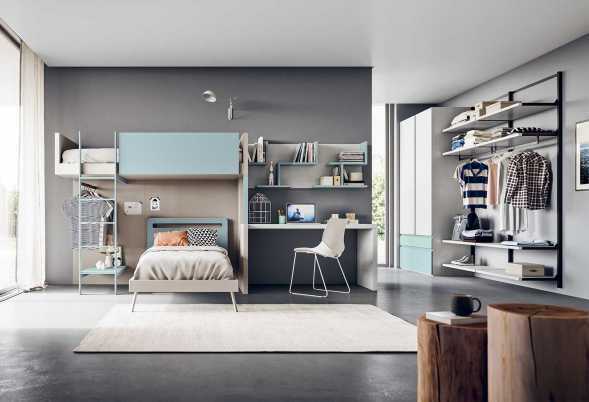 Start S31 offers a modern and customizable idea for a boy and girl shared bedroom that features a corner bunk bed with wardrobe and a study area with desk. Start S32 bunk bed and desk set for kids bedrooms is a space saving package featuring two beds, study area, two-door wardrobe and a modern open closet system available in any size. Start S33 is a corner kids bedroom set, for boys or girls. Featuring a walk in wardrobe with a corner layout and built in bookshelf, the set comes with a space saving bunk bed that incorporates a desk. Start S34 bedroom set with bunk bed with wardrobe and plenty of extra storage: a two-door wardrobe, a large open closet system, a cabin bed with drawers. Includes a study area with shelving. Start S35 children’s bunk bed with stairs set offers the perfect bedroom furniture to save some space in your kids’ room, thanks to a smart loft bed and a large 4 door wardrobe.